A great trio of dancing games with enough character development and story to appease longtime fans. Just don't let it be your first taste of Persona. Since Persona 3 in 2007, the Persona franchise has become renowned for its awesome music as much as its storytelling and unique mix of JRPG and dating sim gameplay. The series has seen countless soundtrack and remix albums released. It’s turned musicians like Lyn and Lotus Juice, not to mention series sound director Shoji Meguro, into stars. And lest we forget Atlus’ several Persona Super Live concerts in Japan. These have been incredibly successful, even selling out the famed Nippon Budokan Hall on several occasions. Well, until the night of P-Sound Bomb Live 2017, that is. 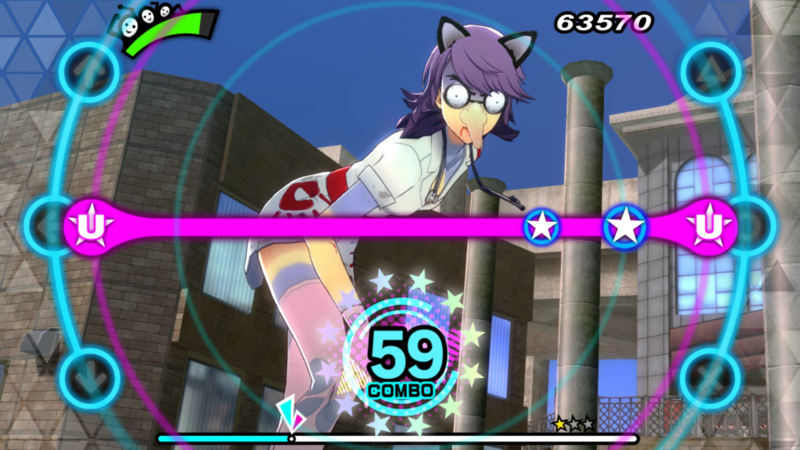 The reveal of Persona 5: Dancing in Starlight and Persona 3: Dancing in Moonlight sent the fanbase into a frenzy. Not only were we getting more content with the beloved Phantom Thieves, it would also be our first time seeing the Persona 3 cast modeled to match Shigenori Soejima’s original designs. Not to mention the killers row of remixers on the projects, such as Taku Takahashi, Sasakure.UK, and of course, Sega legend Hideki Naganuma. Now, a little over a year after its announcement, the Persona Dancing Endless Night Collection has arrived on western shores. Armed with over 60 songs and countless customization options between both games, as well as a port of Persona 4: Dancing All Night, it’s time to step on the floor and see if P3D and P5D not only fix P4D‘s issues, but live up to their original games’ legacies. Rise and Yukiko burn up the dance floor. And their attempts at making curry. 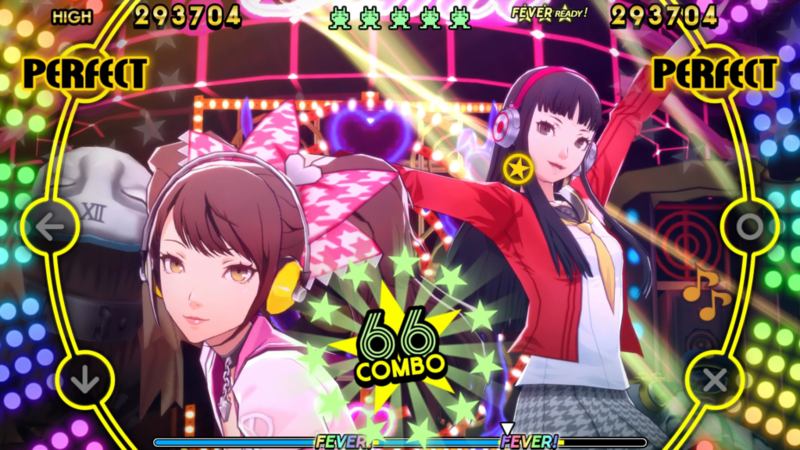 First things first, let’s talk about the port of Persona 4: Dancing All Night for a moment. The original release for the PlayStation Vita and PlayStation TV was, as mentioned above, decent at best. While it looked great, and the soundtrack was straight fire, playing the game itself was quite the chore. Between inconsistent framerates and input lag that even the game’s calibration tool couldn’t fix, P4D just simply wasn’t fun to play. Thankfully, these issues are done away with in this port. The game runs at a crisp and consistent 1080p and 60 FPS, and the input lag issues are gone. The visuals are also updated to be on par with P4D‘s newer, fresher brethren. Models are smoother, details are crisper, and finally seeing the Persona 4 cast in full HD is an absolute treat. For fun and science, I decided to compare the visuals between the original release and this port, and man, the difference is night and day. A comparison between the 2015 Vita release and the 2018 PS4 port. Aside from those improvements, though, it’s mostly a straight up port of the original. The gameplay refinements found in P3D and P5D are sadly missing here. There’s also no added features or content. This includes the slightly confusing decision to not include the DLCs in the port. While previously purchased DLC from the original release will be available at no additional cost, it seems strange to not just throw it all in from the jump, considering the port is only available in the Endless Night Collection with no planned standalone release. It’s still a very neat cherry on top of the collection though, and it’s inclusion alone makes the triple pack an even more appealing option for those who planned on buying both P3D and P5D anyways. It also keeps people like myself from having to deal with setting up a PSTV anytime they feel like watching Naoto Shirogane make vaguely sensual finger guns… I mean… Moving on! Ever the fan favorite, Makoto takes center stage in one of Persona 5’s most recognizable areas. With that out of the way, let’s dive into both Persona 3: Dancing in Moonlight and Persona 5: Dancing in Starlight. A piece of trivia about these games’ development mentions that both were originally meant to be one single Persona rhythm game. They ended up split due to the aesthetics and themes of their origin games not fitting together. I bring this up here because, man, that really shows from the jump. P3D and P5D are two sides of the same coin. To put it bluntly, the games being split feels like what Nintendo does with Pokémon, or more thematically fitting, the Fire Emblem Fates duo. The same gameplay, missions, achievements, accessories… Everything that isn’t the characters, songs, or aesthetics is duplicated between both games. The game’s excuse plot acknowledges this as well, being a cosmic dance-off between S.E.E.S. and the Phantom Thieves. Both P3D and P5D forego a story mode in favor of Social Link scenes with each playable character. Yes, the game does have a plot again, but Atlus has definitely learned their lesson from P4D’s story mode. This time around, the plot is much lighter, and in lieu of a story mode, P3D and P5D focuses on character interaction and development using a variant of the mainline series’ famed Social Link system. 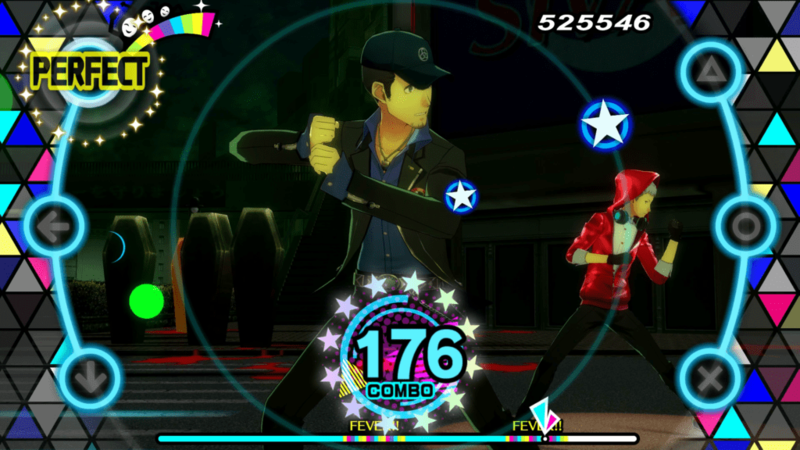 By completing various challenges throughout the rhythm game, such as hitting X amount of Perfect notes or clearing songs with a certain number of costumes, you unlock short scenes with each playable character. This also includes the ability to visit and explore each character’s personal rooms. As someone who loves getting additional insight into my favorite characters, I definitely feel these games are better for focusing more on that than trying to force a story mode again. Between that and also being the primary way to unlock the metric ton of both gameplay and visual customizations, it helps the replay value a great deal. The customization potential is off the charts. You, uh… You okay there, Yukari? Then again, I’m not so sure P3D and P5D really need any help in that department, because once they get their shadowy little claws into you, it’s hard to get away. There’s so much to unlock, so many songs, and the games just feel wonderful to play. They’re so ridiculously addictive, more so than their predecessor ever was. With that game, I’d had my fill of it within a week of purchasing it. With P3D and P5D, I’ve been playing them pretty much non-stop for the past three weeks, with only a couple breaks, and I still haven’t gotten tired of playing them. Another reason I’m glad that P4D was included in this collection is because it makes the refinements and improvements Atlus made to their rhythm game system so much more apparent. The note placements make more sense, although there were a couple of songs that still felt messy. There are no lag or framerate issues, even with some of the more ambitiously designed dance videos. The only major complaint I have is the screen layout. Am I old-fashioned? Maybe just old? Maybe it’s just the difference between playing on a small Vita screen versus a large television screen? No matter the reason, the around-the-screen layout the Persona dancing games use is just flat-out uncomfortable. Even on my best days, it still causes my eyes to constantly dart back and forth across my screen, far more than any other rhythm title does, and makes me need to take breaks too often. 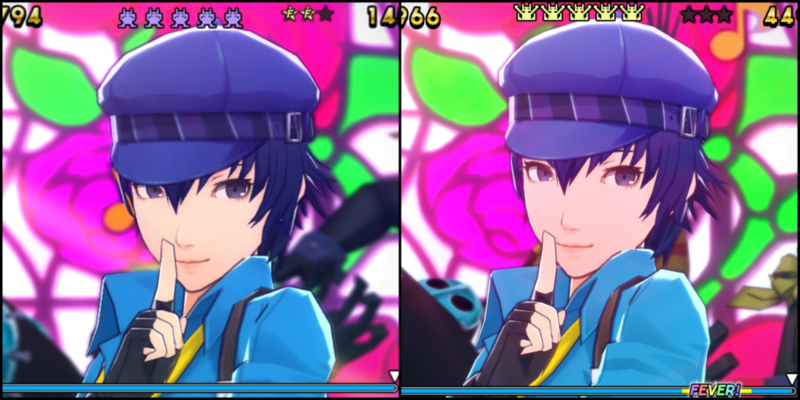 That said, both games’ respective layouts are massive improvements over the original one in P4D. Notes stand out better and scratches definitely don’t blend in with the background anymore, but they’re still quite tiresome to follow, especially with everything else going on. It’s still hard to believe this dude is a sublime master thief. In any case, P3D and P5D are both absolutely gorgeous to look at. Beautiful character models, fantastic looking environments. Even the little things, like replacing static 2D character artwork with 3D models in cutscenes. This does wonders to develop these worlds further and truly bring them to life. It also helps that both games’ characters have never looked better. I can’t lie, seeing the Persona 3 cast as Soejima envisioned after all these years brought a tear to my eye. 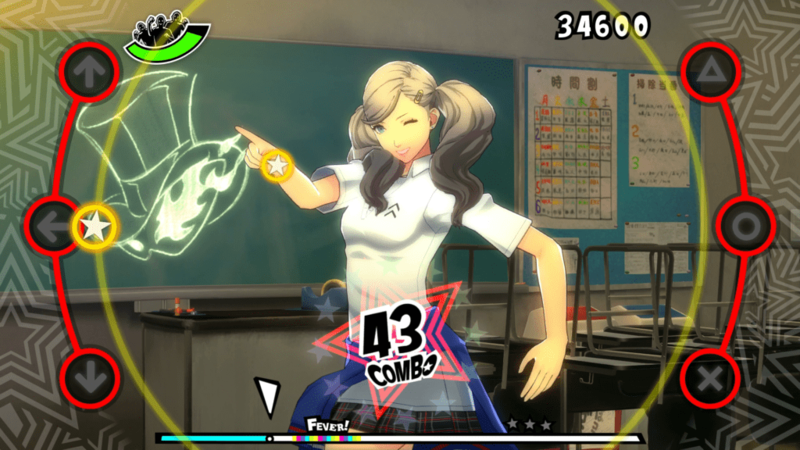 The dance sequences are also much improved over P4D‘s. One of the complaints about P4D was that many of the dances were too samey, and didn’t quite individualize each character either. Not the case here. 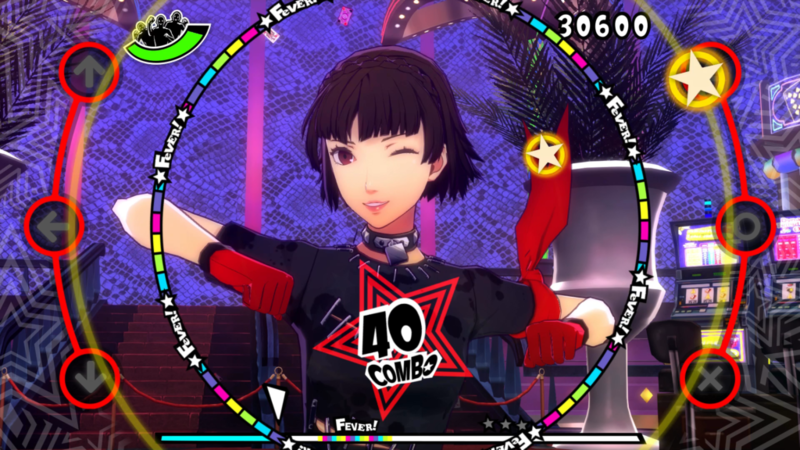 Atlus assigned a specific dancer and style to each character’s motion capture this time, and it goes a long way to showcase their personalities. 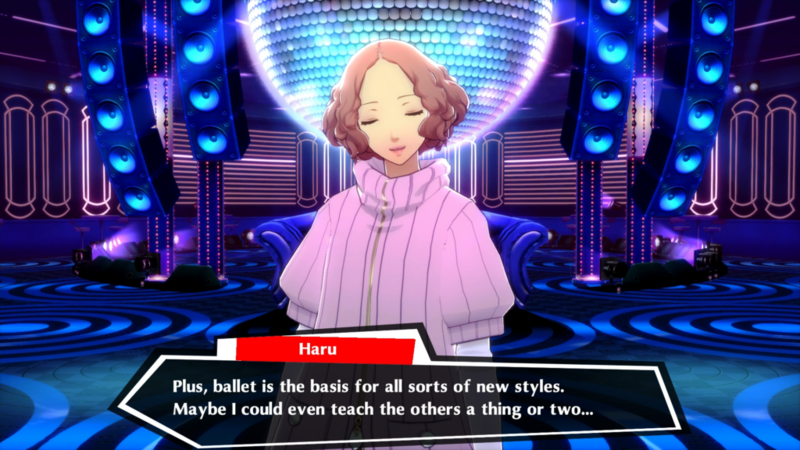 From Haru Okumura’s gorgeous ballet moves, to Junpei Iori’s strange yet oddly satisfying baseball-influenced dances, these sequences do a much better job of showing you who a character is and what they’re about this time around. Baseball, boxing, aikido… If it exists, you can make dance moves out of it! Of course, the most important thing to a good rhythm game is its music, and both games live up to their franchise’s obscenely high standards. While a couple of the songs don’t exactly hit their mark, that’s more the exception than the norm. I’d even go so far as to put a couple of my favorites on par with some of the best in series history. The voice acting is as good as ever as well. Some lines will become grating due to repetition, and I’m not quite sure how I feel about the direction they’ve taken a couple of characters. Regardless, everyone brought their A-game to the booth. The love these actors have for their characters shines through with each line, especially on the Persona 5 side of the coin. The dialogue is very well done, full of the same charm and emotion you’d expect from the mainline games. I can’t help but feel like Ann is intentionally trying to misdirect me here. If there’s anything else I can nitpick, it’s that they’re not exactly a great entry point for the Persona series. Both games come in hot with massive spoilers for their JRPG big brothers right off the bat. Even the full, unedited ending and staff rolls from both games show up as early game songs. While it’s not as much of a problem for Persona 3, being 11 years old at this point, spoiling Persona 5 so early is a bad move. Especially as, unlike P4D, neither game is an actual continuation of their respective stories. That said, I’ve really enjoyed my time with these games. They’re the most fun I’ve had with a rhythm game since Project DIVA F 2nd a few years back. They’ve also had the added effect of making me want to replay both Persona 3 Portable and Persona 5. 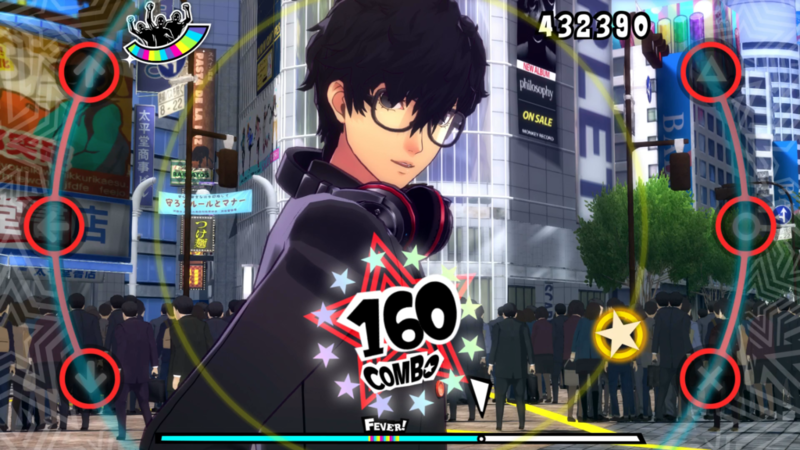 Atlus has done a wonderful job taking a solid look at the criticism Persona 4: Dancing All Night received, and working to improve their formula for P3D and P5D. 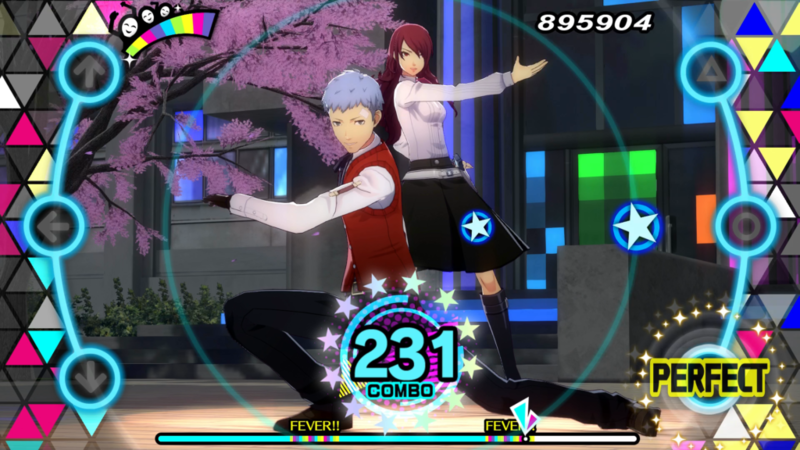 Mitsuru and Akihiko, being the fabulous senpais and shadow exterminators they are. I’m not so sure about the $60 price tag for each game, I admit. Especially when they’re both so similar in non-aesthetic content. That said, if you’re a Persona superfreak, or just enjoy great music games, I absolutely recommend grabbing the Endless Night Collection. Three great rhythm titles for far less than all three games individually is a fantastic deal. Now, if you’ll excuse me, I need to practice these songs while waiting for a Persona 5 Arena announcement. …That IS coming soon, right, Atlus? The Endless Night Collection is 20 bucks cheaper than buying both games individually, plus you get P4D for free. Greatly improved controls and note placement compared to their predecessor. Junkies for good character development will absolutely get their fix with the Social Link system. Outstanding visuals and music, with a star-studded collection of remixers to boot. While 99% of the music is great, there are a couple of stinkers in there. The game’s screen layout is still quite awkward, especially on larger screens. All three games come at you fast with major spoilers for the mainline games, which closes the door to newcomers. P4D not coming with all of its DLC included is a slight bummer.